For two weeks, ten, 26-foot long floats carrying magically-illuminated enormous lanterns such as a dragon, adorable pandas, pinatas, and other objects will appear on February 9th from 7:00-9:00 PM each night. The last night to take in the beauty is February 23rd. 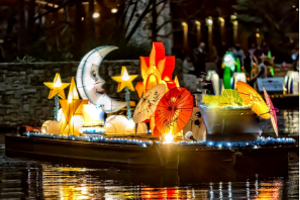 Enjoy the magically illuminated floats from anywhere along the downtown portion of the River Walk.